Dead Cells is a dark and foreboding game, one that tests your patience and dexterity. 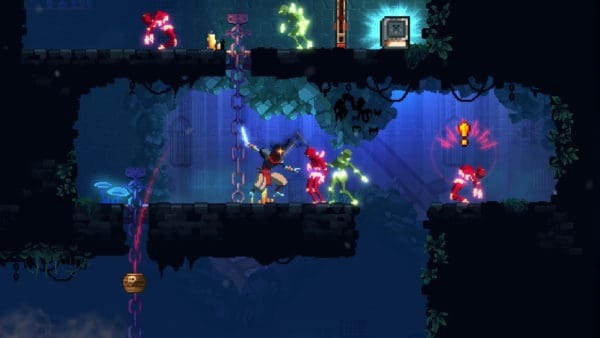 It is also a superb 2D platformer, easily one of the year’s best and continues the general trend of excellent recent Metroidvania games and 2D games, at large. 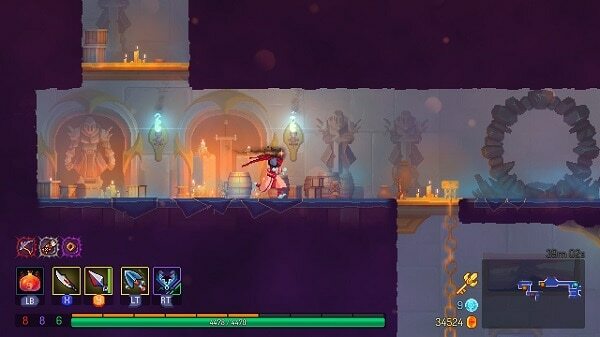 Dead Cells isn’t too concerned with plot, to put it mildly. While there is some flavor text and backstory to what’s happening, it’s not overly clear as to the overall story. At the start, you are a mass of green leaves and tendrils that seem flushed from a sewer. You quickly scurry to a headless body, take it over, and this is your playable character. From then on, you kill monsters, collect gold and cells. While also acquiring new weapons and blueprints along the way. All in an attempt to find your way out of the various environments. You also die quite a lot too. The granularity between genres of Rogue Lite and Roguelike really bores me so I’m not going to get into the minutia here. 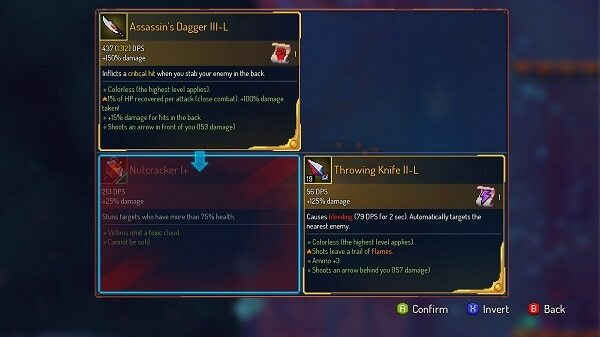 Honestly though, Dead Cells can fit into both classes just a tad. Every time you play, it’s basically a run. Levels, monsters, and power-ups are randomized to a large degree. However, the actual stage environments stay the same. For example, you always start off in the prison, but the way the level is constructed is different from stage to stage. Also, something rogue-ish is that there’s very little in the way of permanent upgrades. There are a handful of runes you collect, but those only appear once you get to a certain environment (Biomes in the parlance) and kill a certain elite enemy. Runes let you break through certain floors, or climb up walls and are permanent once you collect them. Combat is the real meat and potatoes of the game. And it feels rewarding and impactful. Your two attack buttons are mapped to X and Y. While your two items are LT and RT, with A button serving as your jump (and double jump) button. The B button is the combat roll. LB is used to break out your health flask and regain some health, but you have to hold the button down to drink it. The combat roll is absolutely critical. During the roll, you have a few frames of invincibility against attacks. You can use the roll at just about any time, so you always have an option to avoid enemy attacks if you time it just right. 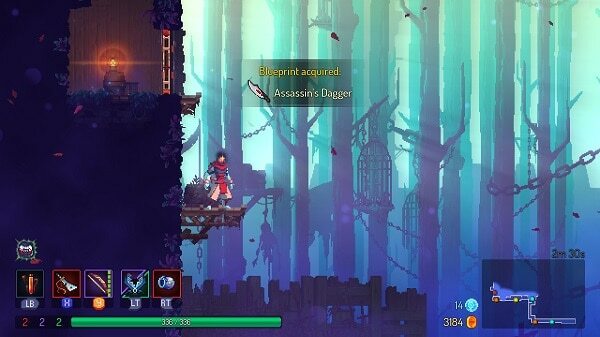 The rogue-ish things happen during the stages where you collect gold, new weapons, cells, and blueprints. Cells drop off enemies and look like energy spheres. You use them to actually unlock blueprint items and additional permanent upgrades with a Collector of them. The upgrades it sells can make it easier for future runs like letting you start off with some gold, increasing the number of health flasks (potions) you can use, and so on. Blueprints drop from enemies and can occasionally be found in the various levels. Blueprints let you unlock additional weapons or mutations, but require multiple cells to unlock them. For example, it may take five cells for the Blood Sword but 30 for the Infantry Bow. The thing with blueprints is, you have to actually make it through a level to drop them off to the Collector. 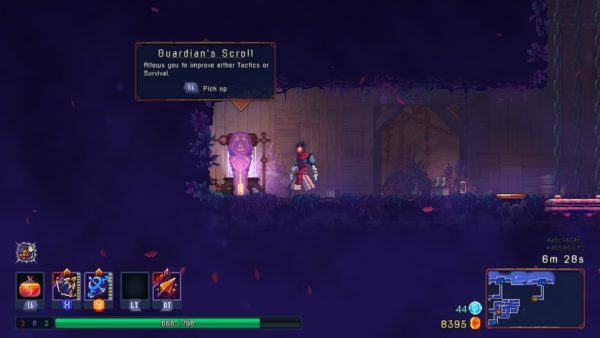 If you die during the course of a level, the blueprint (and your cells) are dropped and you have to make another run and hope the blueprint drops again. Weapons and equipment are likewise dropped when you die during the game. Weapons and items are usually dropped by enemies but can also be occasionally found just as you explore. There can be quick daggers, large broadswords, fast whips, ice grenades and more that drop from enemies or that you can find. Most of them have some perk associated with them like “Set enemies on fire” or “Shoot an arrow when you attack.” As well as having a DPS, color, and attack number associated with them. 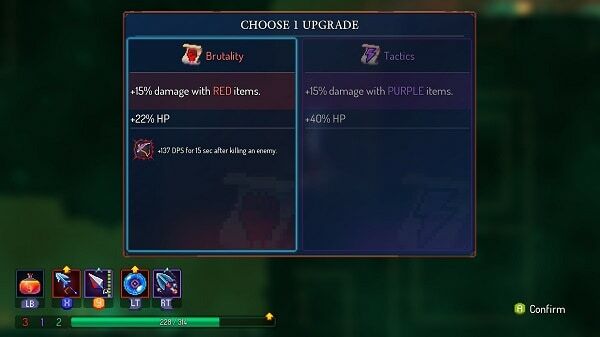 Weapons (and items) in Dead Cells are attuned to one of three colors: red (Brutality), purple (Tactics) and green (Survivability). Typically, the colors tend to fall into classes as well. Red is for melee, purple is for ranged, and green is for support items, but not always. Also, weapons can have a dual-color spec, so a sword could be red and green, or a bow could be purple and green. Finally, the highest grade items are legendary and are “colorless.” What the game does is level up the weapon by using the highest stat you have. The colors are also part of the stat system, which upgrades your character for subsequent runs. During the run, you’ll find Guardian Scrolls which let you upgrade your character. These let you bolster one of the three stats mentioned above. This means your character can gain some HP and also increase the damage of the weapons/items that use that color. At first, the stats gained are high but with each successful level in a specific color, the bonuses get less and less. For instance, for the first level of Survivability (green) you’ll gain 60% more health. For the next level, it’s around 38%. Then it only goes down from there. It sort of makes sense because this allows for more balanced character building. If you just spec towards red constantly, the game could get boring and it would lead the player to only use a few specific weapons. Alongside buying upgrades between levels, another thing you can do is take mutations. These are run-specific bonuses that you can utilize to make the game slightly more reasonable. They are also divided into the color system, red is more damage focused, purple is for ranged attacks, and green can help you regain or increase HP. You can only use three mutations per game, but you do have the option of wiping the slate clean, if you want to pay for it. More mutations are unlocked with successive playthroughs or from blueprints. 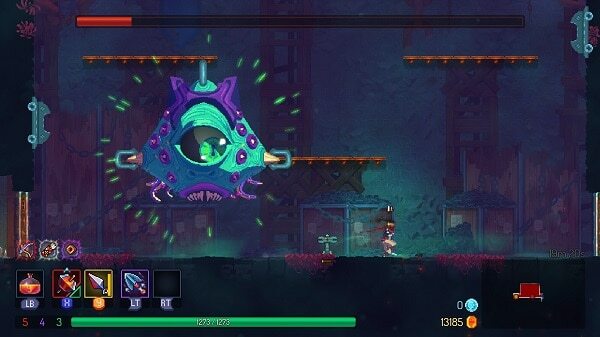 The real gameplay loop of Dead Cells is finding new blueprints, gathering souls, unlocking things between levels, and trying to slay the bosses. Runs can last anywhere from two minutes to one hour, depending on how much you want to explore or if you have a particularly bad random game. There are a lot of secrets for you to find and you’ll spend a ton of time trying to find them all. Both the audio and the visuals in Dead Cells are great. The visuals may not be super impressive. However, there are some lovely vistas in the game, particularly in the later levels. Likewise, the music is superb and the soundtrack is well worth checking out. The bosses can be pretty tough and will try your patience. 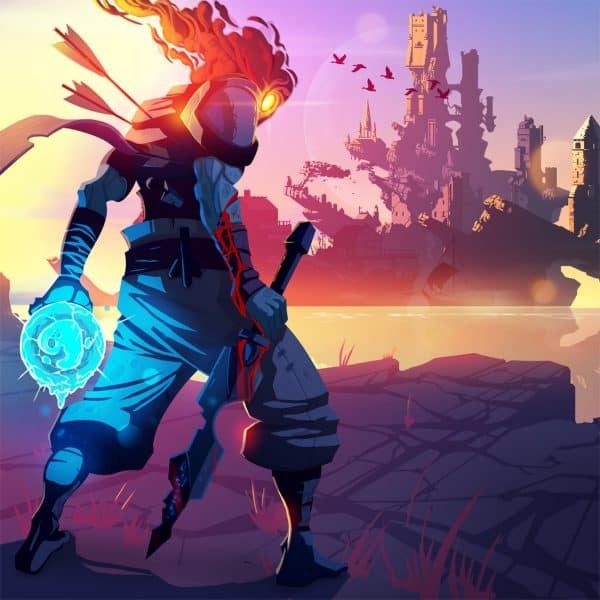 Overall Score: 9.0 Out of 10 Dead Cells easily fits into the great pantheon of various other Metroidvania/Roguelite games. It’s challenging, fun, and has a metric ton of things for you to unlock. The game can be very tough, but you are rewarded for persistence. 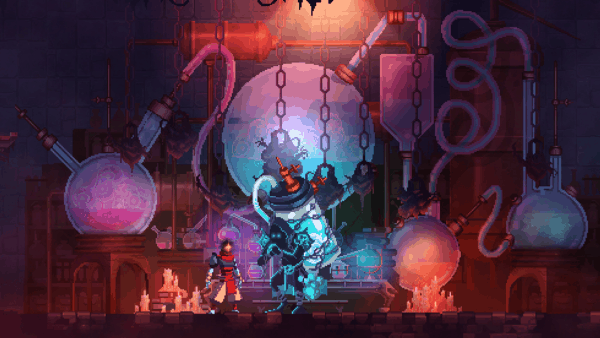 On whatever system strikes your fancy, Dead Cells is an easy purchase. This game was reviewed using a digital code provided by EVOLVE PR.